Some people enjoy keeping their feet on the ground. Others like the feeling of their stomach rising up into their chest. 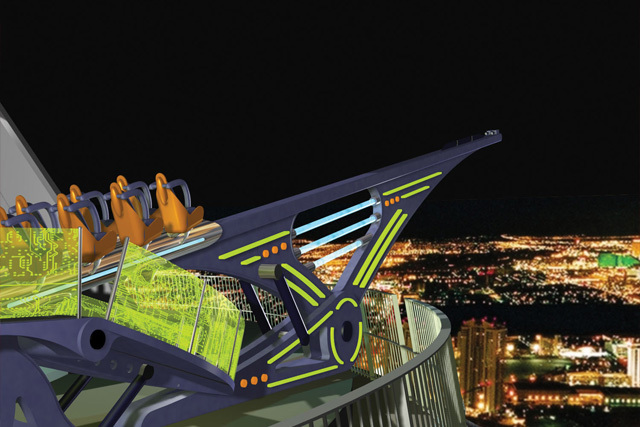 For the latter, the Stratosphere has a quartet of attractions that will satiate their need for thrills. The Stratosphere is iconic to Las Vegas' profile, jutting over 1,000 feet into the skyline. The large structure houses its own bit of adult entertainment with a large casino floor, but there's much more to this impressive structure than "play it safe" gaming. At the highest point of this structure is a series of thrill rides that make even the scariest roller coasters look like weekend drives across the country. Probably the least thrilling "ride" at the Stratosphere is the Sky Jump. Least thrilling, of course, when compared to the other death defying attractions. Guests will tether up and be bungeed to the 108th floor. In one thrilling second, they leap off the ledge and plummet 829 feet to safety below. It's hard not to get caught up in the thrills as you zoom past the Top of the World restaurant, knowing that inside someone is cursing your bravery. If you're brave enough to go on a ride called "Insanity", than you pretty much deserve what comes to you. A mechanical arm outfitted with harnessed seating will dangle you and anyone crazy enough to go with you 64 feet out from the edge of the Stratosphere. 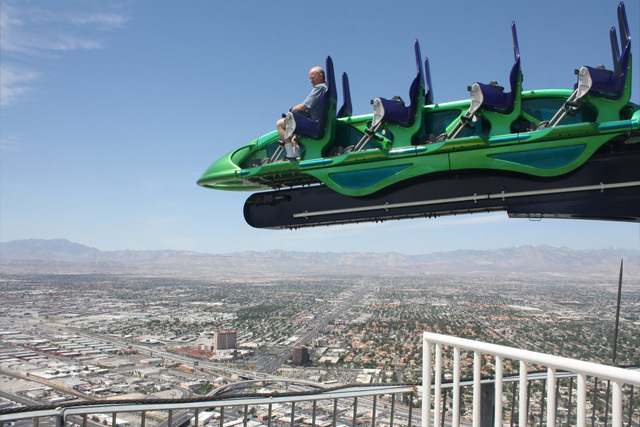 If that's not thrilling enough, the ride will then spin you at a speed of up to three G's, only to turn you 70º so you're staring straight down at historic downtown Las Vegas. What's more fun than dangling 866 feet over Las Vegas? Nothing, right? Than you will love X-Screa, a ride that propels you and other loons, head first, 27 feet out from the Stratosphere's edge. The ride repeats itself, dragging you back in only to propel you out once more, leaving you to simply stare down at the beauty that is the sparkling lights beneath you. Finally, there's the Big Shot. Probably the tamest of all. This ride is seen in many theme parks around the world, but this one takes you 1,081 feet high. You'll be thrown 160 feet into the air at 45 miles per hour, where you will get a moment of reprieve before dropping the full 160 feet. The process repeats enough times for your stomach to finally catch up to you. There is plenty to do in Las Vegas, but to some the partying, gambling, and eating are just not thrilling enough. At the top of the Stratosphere rests a foursome of insane attractions, all begging you to ask just how brave you really are. It's true when we say there truly are no comparable experiences to these in Sin City. Sunday - Thursday, 10 a.m. - 1 a.m. Fridays, Saturdays and holidays, 10 a.m. - 2 a.m. In cases of extreme weather conditions, schedule is subject to change. $10 Tower admission fee and the rides start from 3.95 for the kids and you could get unlimited rides tickets for $34. You must be 48 inches tall to ride. The views were so stunning. When I went to the top of the Stratosphere to take in the great view, I bit scary but I was able to handle it. Definitely the best thrill ride on the stratosphere.